WIZnet W5200 for QuickStart Product Guide. WIZnet W5200 for QuickStart Demo Code. WIZnet W5200 for QuickStart Board Schematic. WIZnet W5200 for QuickStart Board PCB Design. WIZnet W5200 for QuickStart Board Bill of Materials. 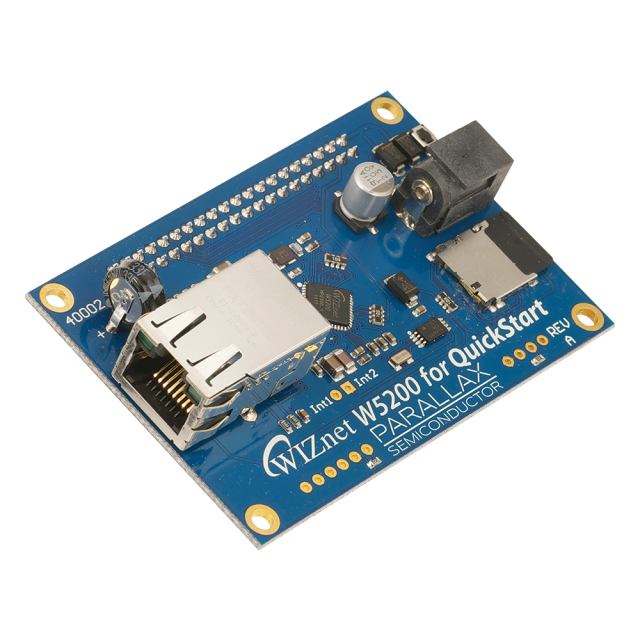 The WIZnet W5200 for QuickStart allows your QuickStart board to serve data to an Ethernet network or even the Internet. The WIZnet W5200 chip provides an Ethernet to SPI bridge which is interfaced with Parallax’s 8-core microcontroller, the Propeller P8X32A. The data served to a network can be anything you want – web pages, serial data, email, and more. Many useful demo programs are available for download from the product page to get you started, including a webserver capable of serving dynamic data from the SD card to your favorite browser. Advanced users can develop firmware that allows the WIZnet W5200 board + QuickStart to respond to or generate any type of network traffic. The WIZnet W5200's web server firmware is ready to host your data on a web page. A package of prewritten Propeller demo programs is provided to get your project up and running quickly. Serve or store files with the included 1 GB microSD card. Communicate on any ethernet port with standard protocols such as TCP, UDP, HTTP, SMTP, and more. Automatically configure network settings with DHCP. Supports Power over Ethernet (PoE) with the optional Silvertel Ag9050 daughterboard, not included. Webserver hosting dynamic sensor data. Multiple Propeller boards communicating on a world-wide network. WIZnet W5200 TCP/IP 10BaseTX/100BaseTX Ethernet controller. Seiko S-35390A I2C Real-Time Clock with super-cap battery backup. 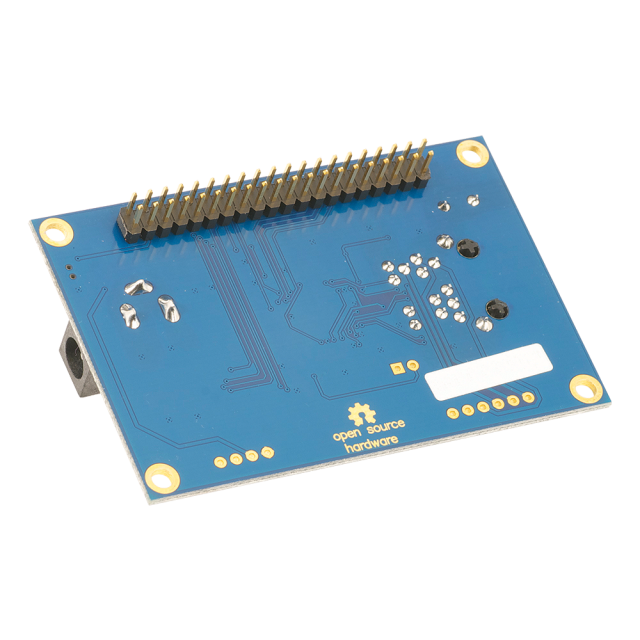 Supports IEEE 802.3af Power over Ethernet (PoE) with optional daughterboard. Current Requirements: 300 mA max current draw, 175 mA typical current draw. Dimensions: 3 x 5 in (7.6 x 12.7 cm). 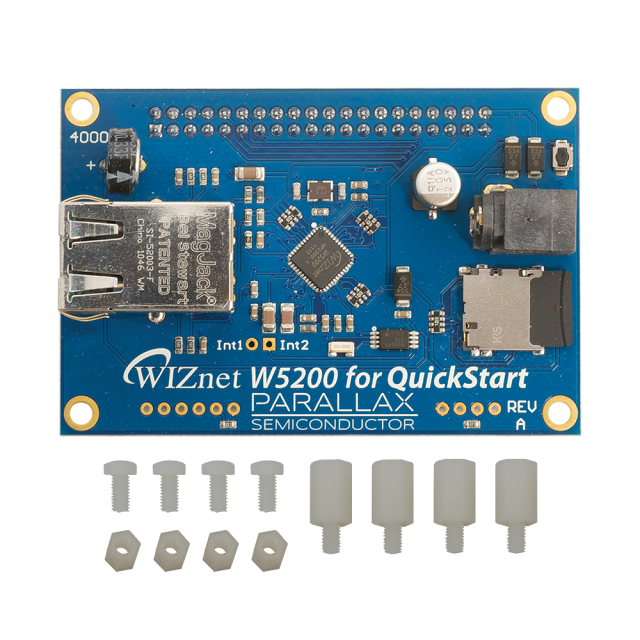 WIZnet 5200 for QuickStart PCB. Home router (necessary for automatic configuration). CAT5 or greater Ethernet cable. USB cable, male USB A to mini-B or 7.5 volt DC power supply with 2.1 mm barrel jack. Phillips #0 screwdriver and pliers for assembly.